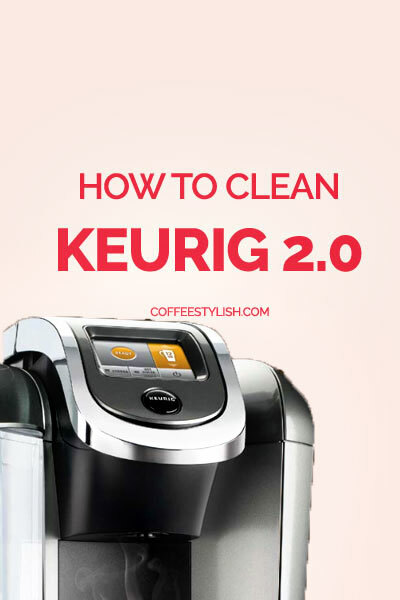 HOW TO CLEAN KEURIG 2.0 – DON’T SKIP THIS ONE! Don’t skip this one! A detailed guide on how to clean Keurig 2.0 and how to descale Keurig 2.0 and make it running efficiently again! Here’s the thing about coffee makers: They get way grosser than you realize. Over time they can collect hard water buildup, mold, bacteria or clogs. About once a month, it’s a good idea to give one of your most-appreciated appliances a quick clean to ensure your coffee taste great and keep your machine running well. Spot-cleaning after spills and drips is easy, but what you really want to do is clean the exit needles, the area around the k-cup holder and the water tank. The water tank will be shiny and clean, and since there will be no oil buildups your coffee will taste much better. This will take 10 – 15 minutes. Do this once a month. I would wash the tank more often, at least once per week. Tip: Quickly rinse the tank and fill it with fresh water every morning, for the best tasting coffee. 2. Remove and wash removable parts: Remove the drip tray, water tank and the pod holder from the unit. Wash all the parts with mild detergent and rinse well. 3. Clean the exit needles. You can use needle maintenance tool for this job, but you can also easily clean Keurig 2.0 needles without a tool. Keurig 2.0 needle maintenance without tool: Turn off the brewer and remove the k-cup holder from the unit. Use a paper clip to remove debris and grounds from the top and bottom exit needle, then rinse the k-cup holder. Here’s a video showing how to clean Keurig 2.0 needles with a paper clip. I prefer this method since it’s much more efficient. If using Keurig 2.0 needle maintenance tool: Turn the brewer off, fill the silicone bulb with fresh water and place the accessory in the k-cup holder. Raise and lower the handle five times to loosen any coffee grounds in the entrance needle. Remove the accessory, turn the brewer on and run one cleansing brew. 4. Wipe the unit: Clean out coffee grounds or any dirt left in the unit – especially around the k-cup holder and the handle, using a toothbrush or a paper towel. They even make special cleaning pods that are designed to remove oil buildups. Wipe the rest of the unit with a damp cloth. Return all the removable parts and plug in the machine. 5. Add water and rinse: Fill the tank with fresh water and run 1 – 2 rinse cycles. Then, use as usual. Descaling is important. It helps clean mineral build-up inside your machine and can help with poor performance. It keeps your machine in a good shape and ensures good tasting coffee. The descaling process should be done every 3, 4 months, depending on the mineral content of the water in your area. You should also descale if the touch screen indicates Time to descale the brewer. 1. Prepare the brewer: Empty the water from the water reservoir, remove the water filter and turn off the brewer. 2. Add descaling solution: Pour 1 bottle of Keurig Descaling solution and 14 ounces of water into the reservoir, then turn on your brewer. 3. Descaling rinse: Place a mug/pitcher on a drip tray, open and close the handle without inserting the pod and press the brew button at 6 ounce setting for Keurig K250 or 10 ounce setting for other models: Keurig K350, K450, and K550. Wait until the solution is dispensed. Discard mug contents. 4. Repeat the rinse process until the brewer indicates “more water please”. Let the brewer stand for at least 30 minutes. Do not turn off the machine during this period. After 30 minutes, remove and empty the water tank and rinse well. 5. Fresh Water rinse: Fill the reservoir with clean water only and again, place a mug or a pitcher on a drip tray. Press brew button to rinse. Repeat brew step until you empty an entire reservoir then refill again with fresh water only. You want to completely rinse the machine and make sure there’s no residue or smell. Two full tanks should do the job. 6. Wipe the unit and wash removable parts: Wipe the machine with a damp cloth, wash all removable parts with mild soap and return them to the unit. Don’t forget to clean the exit needle and the k-cup holder for the best result (explained at the beginning of this post). Fill the tank with fresh clean water and use as usual. If using vinegar, fill up about 2/3 of the reservoir with white vinegar and fill the rest of the tank with water up to MAX fill line. The water filter should be changed every 2 months or 60 tank refills. The water filter on Keurig 2.0 is located inside the water tank, on the valve at the bottom of the tank. There are two types of filter holders for Keurig 2.0 models. The rear reservoir K 200 filter holder, and the side reservoir filter holder for K300, K400 and K500. The filter cartridges are the same and they work with all Keurig 2.0 models. 1. Remove the water tank from the unit, discard water and remove the filter holder from the tank. 2. On the bottom of the holder, press in the tabs on both sides of the base at the same time and pull down to separate. Discard the old filter. 3. Rinse upper and lower filter holder with water. 4. Take a new water filter and soak it in water for 5 minutes. Then, rinse it under running water for 1 more minute. 5. Place the prepared filter in the upper part of the filter holder, close with the bottom part of the holder and set the date 2 months ahead to know when it needs to be replaced again. 6. Place the filter holder into the tank and push down until in place. Be sure to push firmly all the way down to correctly attach the filter. Keurig 2.0 brewers have water filter alert and they will indicate when it’s time to replace the filter. To set the alert, go to settings, water filter reminder, press enable then save. When it’s time to replace the filter the machine will indicate “time to replace the water filter”, press continue, replace the filter as explained above, then press yes, to reset the filter reminder. Best water for Keurig 2.0: Keurig recommends using bottled or filtered water in their machines or using a water filter. Do not use softened water in your Keurig machine. Refill the tank every morning: I strongly recommend refilling your water tank with fresh water each morning. Quickly rinse the tank with water and refill. Of course, that doesn’t mean that you need to waste water or your money. If you have an 80 oz reservoir and you use bottled water for example, don’t fill it all the way up. If you brew 4 cups a day you can add 40 ounces maybe and pour fresh water the next morning. Also, make sure to wash the tank with soap and water at least once every week. Fresh clean water is really important for a good cup of coffee. The key to a great tasting coffee actually starts with a clean coffee maker. Keep your machine shiny and oil-free, and brewing the best coffee at home will be much easier. If you love coffee as much as I do, here’s a list of delicious coffee recipes that you can easily make at home with your Keurig brewer. Here are a few of my favorite hacks that will help you make a great cup of coffee with Keurig. Thank you Muchly! Worked like a charm. I couldn’t find a single fricken paperclip in this entire house, soooo,,,I took one of the skinnier key ring loops and straightened it out which left a nice curved end as a handle and used it. My trusty old drip coffee maker made his solo appearance for this morning, but Keurig is back in action now!! I took my 2.0 machine apart to clean. I removed part 3 and now can’t replace it. Please help. I’m looking for help with this exact issue. ? We have the ‘classic’ Keurig and have only used it for two months. This morning it would only drip and would not get through the brewing process. I put a new filter into the water tank. I cleaned all parts per the instructions. I did buy the descaling solution and tried running it through but still it only drips and I can’t get a full tank of the cleaning solution through the pot! My wife’s friend took it apart and removed the water tubes and mailed them back to Keurig and they replaced her unit. Is this what we need to do? This thing should not be worn out after only 2 months! Please help. Hi Sheila, I’m sorry that you’re having issues with your machine. Cleaning your machine is always a good idea, that’s great! Have you also cleaned the k-cup holder and both exit needles? Sometimes this can happen if the exit needle is clogged. Here’s how to clean them properly. Make sure to clean both – top and bottom needle with a paper clip and the k-cup holder. If you already cleaned them and the machine still isn’t working, please call Keurig customer service at 866-901-2739. I would not disassemble the machine on my own, especially if it’s still under warranty (or the warranty may not apply). Let me know how it went. Read the cleaning instructions again and remembered I had Not cleaned the little sharp needle at the top of the cop that punctures the coffee pod. That fixed it after I used a tooth-brush and I did see coffee grounds come out but thank you so much and now it’s brewing like new again. We have a 2.0 and have been getting the water under pressure message. After cleaning the needle and descaling as instructed it would start to work again, but only for a bit. I’ve descaled that sucker 3 times in the past month, and it always works for a few days then the message comes back. When it is working, there is a loud airy sound that comes through towards the end of brewing a cup. It may have been there a little since the beginning, but now it has gotten way louder and longer. This morning I noticed that while the machine was preheating it was dispensing water. Not a ton, but certainly a steady trickle. Are all these issues connected? Anyone else have problems with the noise or the trickle of water during preheating? Contact Keurig about your issues, your machine sounds like it’s got an issue. Or you have some serious mineral deposits in your water, try using bottled water after your next cleaning and see if your problem continues, if it does then it’s definitely a hardware problem. I have a 2.0 and went crazy looking for where to replace the filter. Only to discover the piece wasn’t included with my coffee maker. Suggestions??? you can purchase the water filter kit for your 2.0 at keurig.com or Amazon. If you have Keurig K250, you only need to buy water filters and place one filter in the original holder. My kuerig screen has the message “sorry there is a problem. Water under pressure.” Anyone else have this problem? the “water under pressure” issue usually indicates the problem with the exit needle. Carefully open the handle, take out the pod and clean the exit needle. You can either use a paper clip or a the maintenance accessory (the little orange tool) that came with your brewer. Here’s how to clean exit needle on Keurig 2.0. If this doesn’t solve the problem, I recommend to call customer service. Thanks for stopping by! Thank you for these instructions. Before cleaning the pump would only give two squirts then stop. Cleaning the entrance needle restored full operation! I have keurig 2.0. I can not brew coffee on the normal setting. I works only get 2oz off coffee on the 8oz setting. I would sometimes get 10oz on three 4oz setting. After trying cleaning descaling and trying turning off,unplugging, holding the off button and every other tip I can find….ugh I can only get coffee off I use the hot cocoa button and it often takes a few tries to get 10 oz. No matter what amount of oz I press it is always giving me a other amount. 16oz comes out of 4oz, 2oz congress out of the 10oz, sometimes 6oz of the 6 oz but it’s like a surprise as to how much will come out. Any ideas of how to fix this. I am sure calling customer service will just have me purchase me brewer at this point I will go back to a standard coffee maker for $10.00 verses another $140.00 machine. I will not spend anymore money on broken machines. Esp after I have learned most computerized appliances malfunction within a month of its warranty this is because corporations do not make money off of working products. So they are actually programmed to malfunction. If enough consumers complain that is the only way they issue a defect and recall. I personally have had enough of this b.s. Hi Patricia, I would call Customer Service just in case. The machine is obviously broken so maybe there’s a small chance they will offer you a replacement especially if it’s still under warranty. If they don’t, then you can go back to a standard coffee maker. You can also try this fix: unplug the machine, remove the reservoir, turn the machine upside down, tap the bottom, and shake it a little bit. Then put the reservoir back and turn the machine on to see if it will work normally. This helps with short cup problem on classic Keurig models, maybe it can help with your model too. Let me know if you need anything else. This happened to us at work and we realized it was only for one particular person. She was using an off brand like Maxwell House International Cafe coffees. No one else seemed to have the problem. She stopped using those pods and the problem went away. Nice directions but I would like to see added a note on how much white vinegar to use for the de-scaling. Hi Jon, I would fill up about 2/3 of the reservoir with white vinegar (do not add water). That’s 30 oz of vinegar for K250, 40 oz for K350, 45 oz for K450 and around 50 oz for descaling K550. I hope this helps.